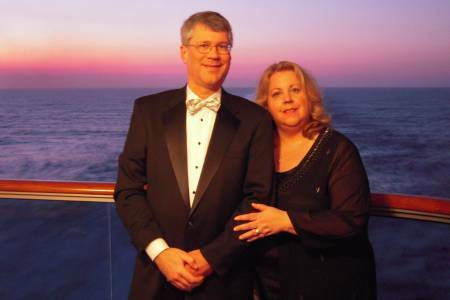 Composer David Stybr and author Denise Swanson cruise into the sunset on the Caribbean Sea. You are visitor number since the Big Bang. 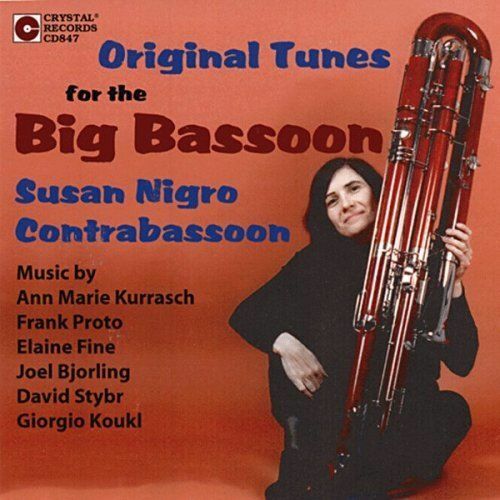 Susan Nigro included David Stybr's ContraBassooNova on her CD: Original Tunes for the Big Bassoon. Ann Marie Kurrasch: A Day at the Park; Frank Proto: Little Suite for the Big Bassoon*; Elaine Fine: More Greek Myths and Harlequin Sonata; Joel Bjorling: Night Shadows* and Dreamscapes*; David Stybr, ContraBassooNova; Giorgio Koukl, Potato polca. *The works by Proto and Bjorling are for Unaccompanied Contrabassoon. On the other works, Susan Nigro is joined by Mark Lindeblad, piano. Crystal Records CD847: Original Tunes for the Big Bassoon. Susan Nigro, Contrabassoon. Writing music is an altogether different experience from listening. It is an amazing feeling to create original themes, and weave them into balanced compositions. He did this for five years, until he felt ready to submit his works to professional musicians. 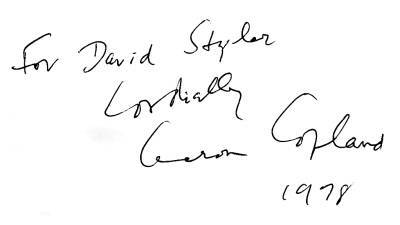 Other works by David Stybr include: Life and Afterlife (Four Elegies for Soprano and Orchestra), String Quintet No. 2 in B Minor and Rolling River Rag. He lives in Illinois with his wife, national best-selling author Denise Swanson. Decisions, Decisions: In the 1970s David considered a career as a composer, and once crossed paths with a musical idol: Aaron Copland. Ultimately David chose another rewarding and "more practical" path, and became an engineer instead. His February 2005 concerts let him experience the alternate universe, had he followed his muse to music. Andante Cantabile for String Orchestra: (after a blind audition) OK — I’ve never heard it before but this is what I heard — modal, moving from major, minor and mixolydian modes, scalewise movement, but some direct modulation. That kind of stuff get us into the early 20th Century, although the style persisted for much longer in certain countries. However, given the fondness for the flatted 7th, I’d guess northern European. The Scandinavians gravitate toward the minor chord on the 4th degree a lot, and I heard none of that, especially considering it’s an anthem-like theme, so I’m going to cross off Sweden and Norway, but leave a little room for the Danes. However, I’m leaning strongly toward the UK (some Eastern Europeans like those scales too, so a bit of a caveat). Elgar is more Germanic than I heard here, much more chromatic, but not so modal, so I’m going to say (gun held to head) [the composer is] Vaughan Williams. I’ve played his variations for brass band and he works the devil out of the pentatonic modes, and the piece is reminiscent of that. Rosie: a Waltz for Orchestra: A very entertaining piece with excellent writing for the individual instruments. Theme and Variations in G Minor for Contrabassoon and Orchestra is quite a nice piece. ... the piece sounds like a continuous whole. It is difficult to nominate a favourite variation, since they all have their points of beauty, so let me just mention two points of special note. The piece contains what I call a "tingle point", where there comes the promise of order emerging from the chaos, prompting an upsurge of emotions in the listener. This comes in the middle of Variation 4 at approximately six minutes in, as the chromatic fugue yields to the diatonic main theme (in G Major), and WE KNOW that whatever tribulations are still to come, the end of it all will be glory. And so to the last variation, where he has avoided the temptation to write a cheap, slushy triumphal march to finish. The triumphal march is there, but it is gently restrained and is all the better for it. Brass Quintet in C Minor: An artist and an engineer, working harmoniously together! ... It delights me to say that I enjoyed the piece. The fact that the author is a scientist as well as a musician illuminates my understanding of a work in which the emphasis lies very much on structure, self-consistency, logical integration and self-fulfilling form. The piece bases itself on the use of clear melodies and forms (sonata, scherzo & trio, rondo etc. ), exuberant counterpoint and unorthodox techniques, harmonies and key relationships. 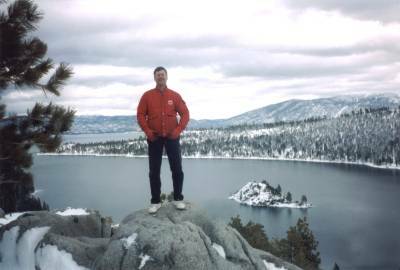 Left: Leap Day 2004, Lake Tahoe, Nevada. Dave felt on top of the world, after he completed the full score of his Theme and Variations in G Minor for Contrabassoon and Orchestra on 29 February. 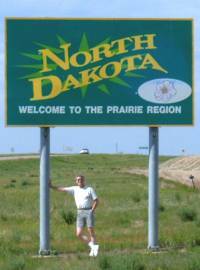 Right: In June 2006 Dave visited his 50th state: North Dakota. Shortly after this photo was made near Strasburg, Dave slipped and fell flat on his face. A nearby farmer reported that he was proud to see visitors to North Dakota kiss the ground upon crossing the state line. This web site is purely for entertainment and information purposes.